Text effects seem to be ubiquitous these days, with a garden variety of apps for both iOS and macOS. Fortunately Art Text 3 by BeLight Soft, stands alone for its robust versatility and professional capabilities. For beginning creatives, designers, or graphic artists who don’t want to shell out big bucks for Adobe Illustrator or other text software, Art Text 3 is an affordable choice that offers a lot of practical options. In addition to creating myriad 2D and 3D text effects, this software also creates web buttons and icons, logos, background effects, and offers custom templates. Unlike Adobe Illustrator, which has a steep learning curve, Art Text 3 is easy to use and the main window is straightforward and minimalistic. The canvas or art board occupies most of the center space, with icons along the top left hand drawer that contain a library of templates, smart and custom shapes, backgrounds, canvas effects, and layers. On the right side of the canvas is the Inspector shelf where you can select fonts, kerning, fill, stroke, textural effects, masking, and alter geometrical shapes. Along the bottom of the canvas you will find the zoom, document size, layer options including Boolean operations, and save and share options. I enjoyed the ease of being able to modify and control effects directly from the main window. 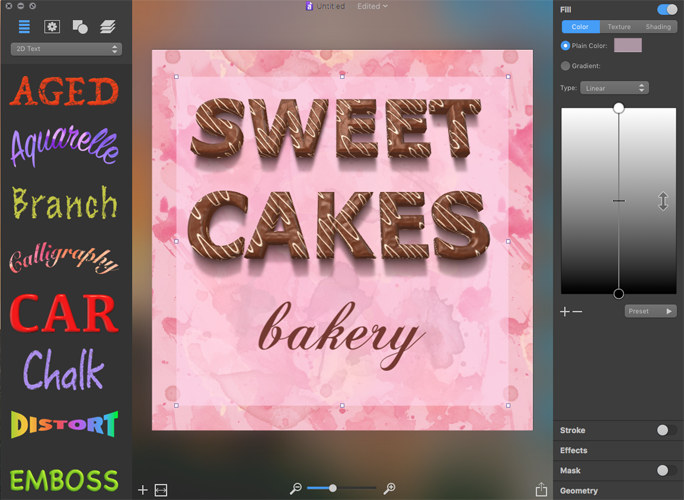 If you want to dive right in and create text effects, this software allows that. If you want to know more about what the software can do and how to create certain effects, there is a good Quick Start guide under the Help tab. The Help guide also includes all of the keyboard shortcuts for the application. 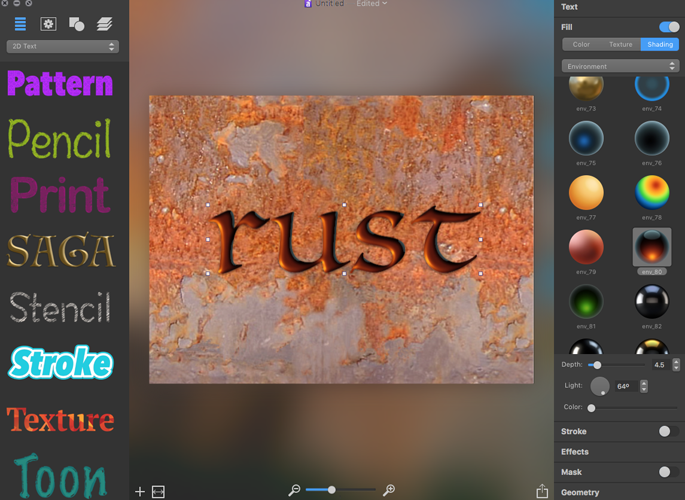 Art Text 3 gives you access to all your installed fonts and photos for importing as backgrounds or effects. In the image below I selected a photo and then used one of the Smart Shapes to create text from the image. The Smart Shapes and icons are vector images that can be rescaled without quality degradation and there is also a vector editor that provides further editing of the shape. I do wish there was a drag and drop capability for photos from a folder or from Photos as you have to open Photos in order to access your images. Particular 2D and 3D text effects will give you the option to install the text effect font if you are missing that font. 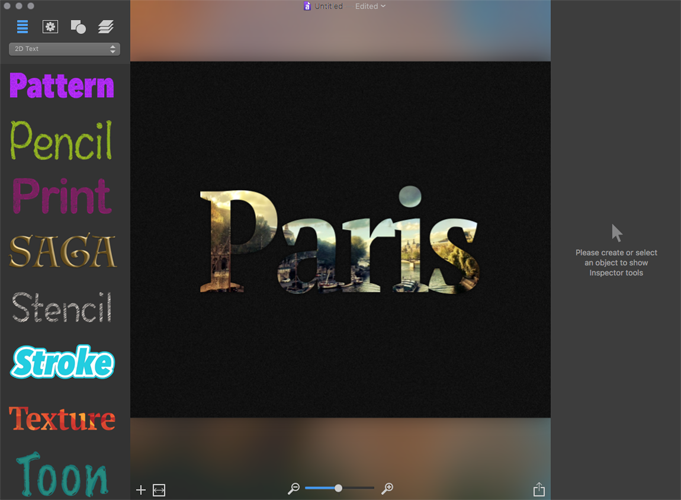 This application offers a multitude of text effects, varying in complexity. Personally I found that a few of the 3D text effects were a bit too cutesy for my taste but some designers may have a need for such effects. For example, some the text effects look like swiss cheese, clay, foam, sprinkled donuts, and wood, to name a few. That said, each of those effects are completely customizable to make a more unique text effect. Art Text 3 allows you to change and add blend modes, lighting effects, textures, glow, gradients, shading, shadows, fonts, placement, layers, masking, and curvatures, so you can experiment with each effect to create a distinctive text and effect for a project. I really appreciate the ease of the user interface and the abundant options available to generate text effects. 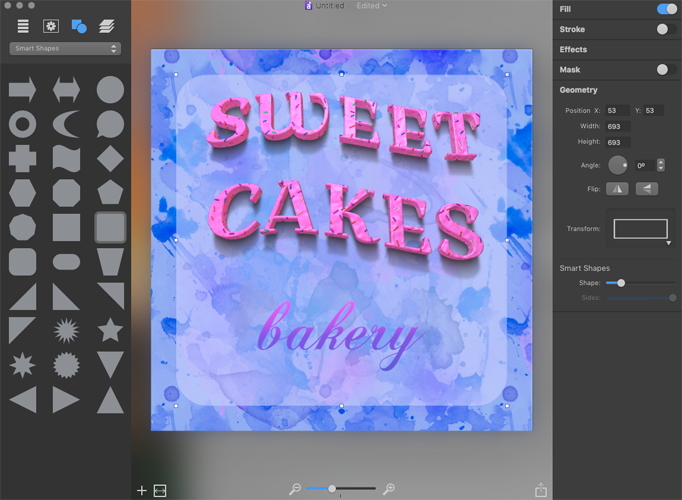 You are able to keep adding layers for shapes, text, textures, and there is a subtraction symbol at the bottom edge of the canvas to simply delete an undesired layer effect. I created the two images below using the 3D chocolate text effect, a watercolor background, and a square shape. By changing the font, background color, and shape color and opacity, a textural image can be created within minutes. Each element is completely customizable as the second image illustrates. I found that this software is very intuitive and it can be quite addicting to play and change the different text and background effects. Unfortunately I did notice that many of the photographic backgrounds such as the rust, wood, and fabric, appear to be low resolution on my iMac 4K display. When I saved the image at high resolution, the image was hazy and unusable. To effectively utilize these images, the photos really need to be high resolution scans. This is quite disappointing as many of the rust images are quite interesting and would make a great background for text. When finished with your text design, you can export it in a variety of formats including JPEG, TIFF, PDF, EPS, PNG, and GIF. BeLight Soft has done a great job with developing a application for OS X that offers a lot of options for text and logo design. I would like to see higher resolution images in a future update and the ability to drag and drop images from Photos. Art Text 3’s reasonable cost, easy user interface, and numerous creative options for text, makes it a solid and viable choice for graphic artists and designers.